Download "CURRICULUM VITAE. Professional Experience"
1 Patrick D. Caffrey, Ph.D. Caffrey Comprehensive Services 8301 State Line Road, Suite 200 Kansas City, MO ext. 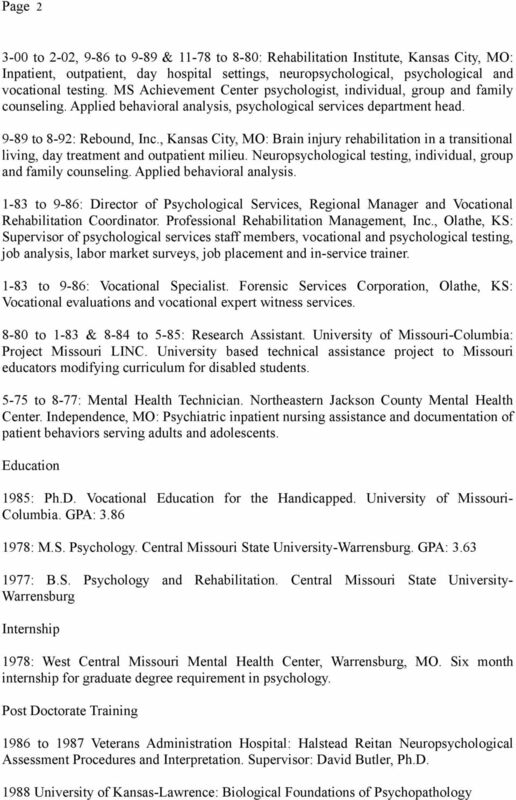 4 CURRICULUM VITAE Summary: Nearly 30 years experience as a rehabilitation psychologist and neuropsychologist, delivering direct patient services, evaluation and treatment in health care facilities and in private practice with additional extensive experience as a vocational specialist, regional manager in private sector rehabilitation, in a university based technical assistance project to Missouri educators modifying curriculum for disabled students, site supervisor of psychological services, researcher/investigator, visiting university lecturer and hospital teaching. Professional Experience 8-92 to Present: Private Practice. 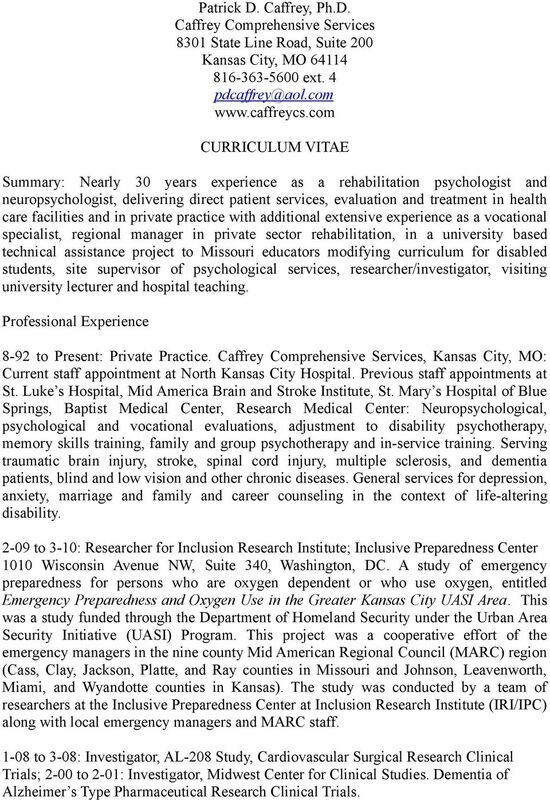 Caffrey Comprehensive Services, Kansas City, MO: Current staff appointment at North Kansas City Hospital. 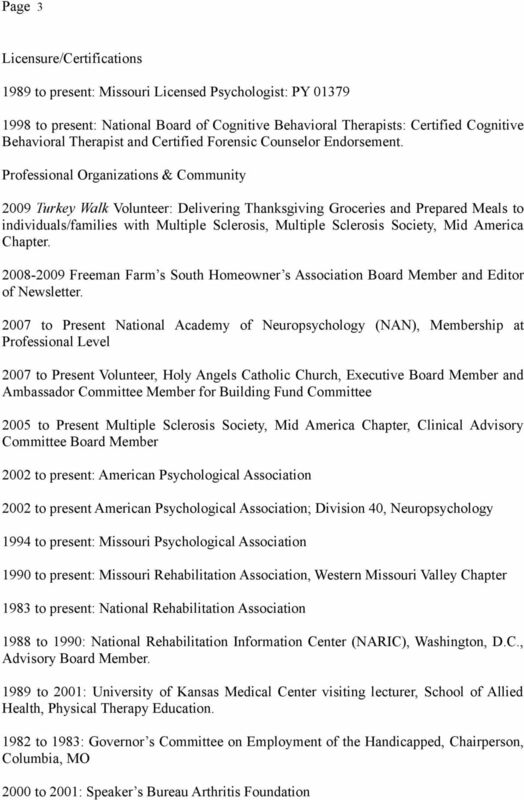 Previous staff appointments at St. Luke s Hospital, Mid America Brain and Stroke Institute, St. Mary s Hospital of Blue Springs, Baptist Medical Center, Research Medical Center: Neuropsychological, psychological and vocational evaluations, adjustment to disability psychotherapy, memory skills training, family and group psychotherapy and in-service training. Serving traumatic brain injury, stroke, spinal cord injury, multiple sclerosis, and dementia patients, blind and low vision and other chronic diseases. General services for depression, anxiety, marriage and family and career counseling in the context of life-altering disability to 3-10: Researcher for Inclusion Research Institute; Inclusive Preparedness Center 1010 Wisconsin Avenue NW, Suite 340, Washington, DC. A study of emergency preparedness for persons who are oxygen dependent or who use oxygen, entitled Emergency Preparedness and Oxygen Use in the Greater Kansas City UASI Area. This was a study funded through the Department of Homeland Security under the Urban Area Security Initiative (UASI) Program. This project was a cooperative effort of the emergency managers in the nine county Mid American Regional Council (MARC) region (Cass, Clay, Jackson, Platte, and Ray counties in Missouri and Johnson, Leavenworth, Miami, and Wyandotte counties in Kansas). The study was conducted by a team of researchers at the Inclusive Preparedness Center at Inclusion Research Institute (IRI/IPC) along with local emergency managers and MARC staff to 3-08: Investigator, AL-208 Study, Cardiovascular Surgical Research Clinical Trials; 2-00 to 2-01: Investigator, Midwest Center for Clinical Studies. Dementia of Alzheimer s Type Pharmaceutical Research Clinical Trials. 4 Page to 2001: Church of the Nativity: Chairperson of Data Gathering Committee and Christmas in October volunteer. 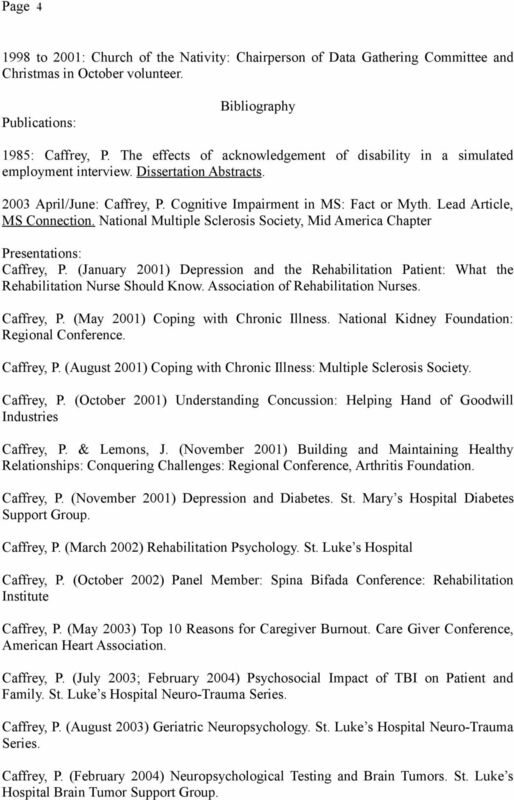 Publications: Bibliography 1985: Caffrey, P. The effects of acknowledgement of disability in a simulated employment interview. 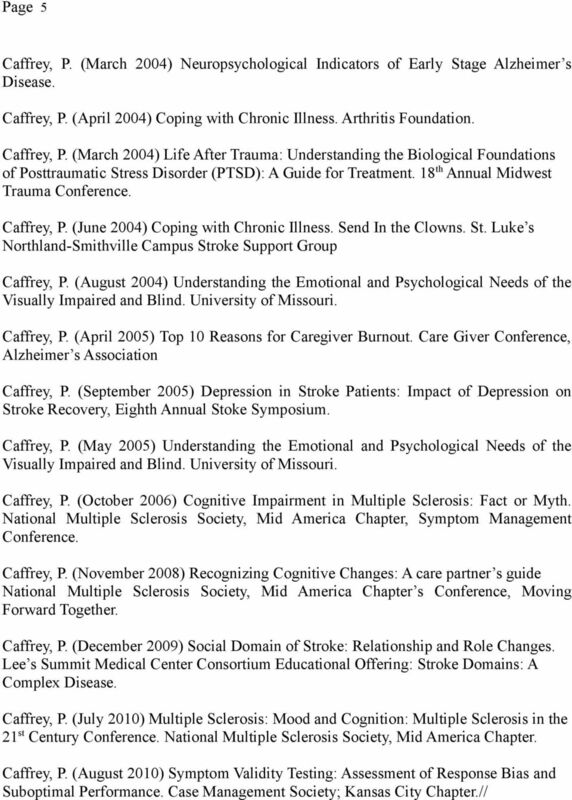 Dissertation Abstracts April/June: Caffrey, P. Cognitive Impairment in MS: Fact or Myth. Lead Article, MS Connection. National Multiple Sclerosis Society, Mid America Chapter Presentations: Caffrey, P. (January 2001) Depression and the Rehabilitation Patient: What the Rehabilitation Nurse Should Know. Association of Rehabilitation Nurses. Caffrey, P. (May 2001) Coping with Chronic Illness. National Kidney Foundation: Regional Conference. Caffrey, P. (August 2001) Coping with Chronic Illness: Multiple Sclerosis Society. Caffrey, P. (October 2001) Understanding Concussion: Helping Hand of Goodwill Industries Caffrey, P. & Lemons, J. (November 2001) Building and Maintaining Healthy Relationships: Conquering Challenges: Regional Conference, Arthritis Foundation. Caffrey, P. (November 2001) Depression and Diabetes. St. Mary s Hospital Diabetes Support Group. Caffrey, P. (March 2002) Rehabilitation Psychology. St. Luke s Hospital Caffrey, P. (October 2002) Panel Member: Spina Bifada Conference: Rehabilitation Institute Caffrey, P. (May 2003) Top 10 Reasons for Caregiver Burnout. Care Giver Conference, American Heart Association. Caffrey, P. (July 2003; February 2004) Psychosocial Impact of TBI on Patient and Family. St. Luke s Hospital Neuro-Trauma Series. Caffrey, P. (August 2003) Geriatric Neuropsychology. St. Luke s Hospital Neuro-Trauma Series. Caffrey, P. (February 2004) Neuropsychological Testing and Brain Tumors. St. Luke s Hospital Brain Tumor Support Group. Careers Day Clinical Psychology 17 th May 2012 Dr Kathryn Sams Specialist Clinical Psychologist Chatterton House, Kings Lynn What Is Psychology? The study of people, how they think, act, react and interact. NANCY H. HSU, PSY.D. P.O. Box 980542 Richmond, VA 23298-0542 (804) 828-8794 office (804) 828-2378 facsimile Email address: nhhsu@vcu. Nicholas Jasinski, Psy.D. 3375 N. Arlington Heights Rd., Ste K Arlington Heights, IL 60004 847-394-4174 njasinski@neuropsych1.com.